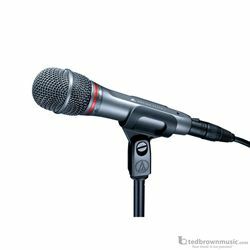 The Audio-Technica AE4100 is a dynamic microphone featuring an aggressive sound that stays upfront in the mix. Its design is optimized for stage use with a cardioid pattern for excellent isolation properties. Superior anti-shock engineering assures low handling noise and the AE4100 mic is built tough for road use. Includes a quiet, flex mount stand clamp. Aggressive sound that stays upfront in the mix. Optimized for the stage with excellent isolation properties. Superior anti-shock engineering for low handling noise. Tough, durable, resilient - built for the road.